200 miles of spectacular scenic views of Lake Huron and an astounding array of large public forest and recreational properties await travelers on the Huron Shores Heritage Route. Beginning in Standish and winding up the Lake Huron coastline, the Huron Shores Heritage Route offers some of the most extensive and significant recreational, ecological, historical and cultural sites in Michigan's Lower Peninsula. The northern Lake Huron shoreline boasts water, forests, wetlands, lighthouses, parks, trails, museums, small towns, culture, attractions, golf, dining, and many other hidden treasures. Visit the US-23 Heritage Route website for more information. Views of freighters, the mighty Mackinac Bridge, Bois Blanc Island and Mackinac Island. Views of Bois Blanc and Mackinac Islands, Mackinaw Bridge in the distance, beautiful Duncan Bay and the Cheboygan River. 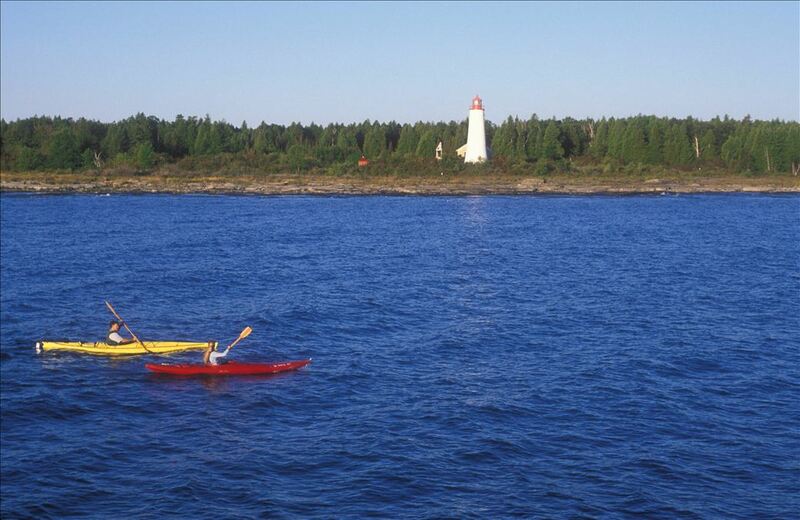 Enjoy the sandy beaches of Hammond Bay, 40 Mile Point Lighthouse and the Ocqueoc River. Enjoy the coastline from Rogers City to 40 Mile Point Lighthouse. Views of Rogers City, Great Lakes freighters, and the world's largest limestone quarry. Explore Alpena, Thunder Bay, shipwrecks, lighthouses, islands, and miles of undeveloped coastline. Experience a paddle along a remote State Park coastline with backcountry camping. Connects three communities, with views of the Sturgeon Point Lighthouse. Paddle the coast along Oscoda, Cedar Lake and the lower Au Sable River. Paddle Albaster, Tawas Bay and and north to Oscoda.